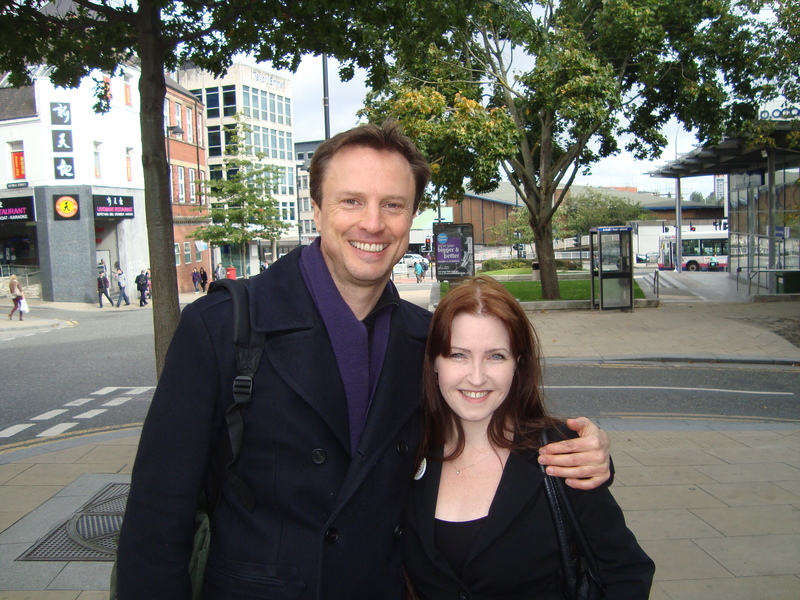 Looking at the picture of Jonathan Firth and I, who I accosted outside of the stage door of the Crucible Theatre, Sheffield. I have to admit that the resemblance to myself doesn’t seem real. Indeed the whole day had the essence of ‘fantasy’ to it and I think someone must have taken over my body as I was transported from my life in Liverpool to over the Pennines to Sheffield. The day started like any other, David went to work while I had taken the day off so I could go to Sheffield, to the matinee and see Jonathan in William Shakespeare’s The Winter’s Tale. It is not my favourite play. Indeed I would like to see Jonathan play Macbeth, but that is my own fantasy. David kissed me goodbye unbeknown what plans I had for the day. Last year we both went to Edinburgh, well David had to go as I demanded it! To see Jonathan play in Good Grief, but it was a disaster waiting to happen. I was so embarrassed to be watching the man I fantasied over while sitting with the man I shared my life with that I could not approach Jonathan at the Stage Door afterwards. However, this time I vowed to myself that I would go. It was a second chance that I just had to take. I also had another reason to go too. I had to deliver all the lovely letters and messages of support to Jonathan from his Facebook fan page. I really couldn’t believe that I was the one playing ‘Hermes’, the messenger this time. I managed to leave the house around 9.15am, all made up! I walked unsteadily on my four inch high heeled shoes; I wore them because I knew Jonathan was tall. Much taller than I! I said goodbye to my mum who said ‘I hope you get to see him!’ and made my way to the bus stop! Then I waited ages!! Well it seemed like ages. While I stood at the bus stop, the cold autumnal wind blew my hair about like medusa’s snakes; I dithered while holding the letters for Jonathan. Then the number 14 bus arrived (followed by many more as is always the case) and I dived on to it. It took me to Lime Street station. I had no time to get lunch so I bounded onto the on time, East Midland’s train to Norwich, which would take me to Sheffield and to Jonathan! The sun in the North West of England was gleaming. It was a most beautiful autumn day. The wind was gusty but my spirits were lifted by the sun, azure sky and the lovely support from the other Jonathan Firth fans! My nerves struck around Manchester, but I swallowed my stress and just went with the flow! Scenery flashed passed as the train made its way across country. City scape then the green vista of the Peak District opened up, beautiful countryside, herds of cows and lines upon lines of dry stone walls! The train’s conductor seemed a character!! He was on the PA system after Manchester saying ‘don’t squash your heavy items in the overhead lockers, or they can fall out and hit you on the head!’ He had me chuckling! 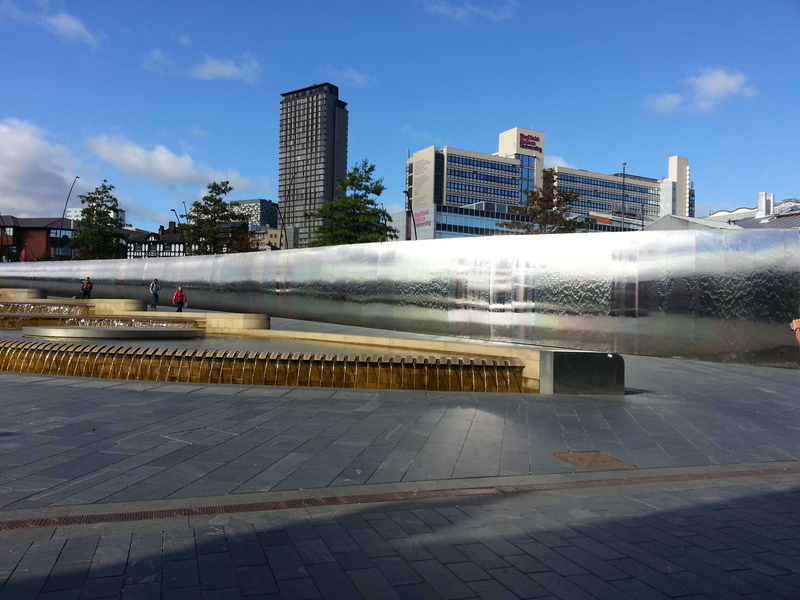 Before long I had arrived in Sheffield. I disembarked the train and then tried to find my bearings. I managed to get lunch of a Tuscan vege wrap and I ordered a café latte to go. I really needed the toilet, nerves and all but they were closed! So I had to just cross my legs and bear it. I followed my new Samsung Galaxy S3 sat nav, but I found that it was taking me away from the Crucible! Time was of the essence and I didn’t want to get lost and start panicking! So I had to rely on good old fashioned ‘asking’ people. I asked one guy but I didn’t think he was from Sheffield, so I asked a woman, who thought I was going for an interview. Did I look that severe? I found that her name was Margaret and she worked at Sheffield’s Radio Station. She was so kind and helpful that I have to mention her. She not only told me the way to the Crucible, she actually took me there! I am so blessed to have met her, and I thank her. I do hope she gets this message as I am most indebted to her. I was quite adrift when she met me. I was in a city I did not know, had technology that did not work and yet she welcomed me and guided me to my ‘rightful’ place. I thank you! 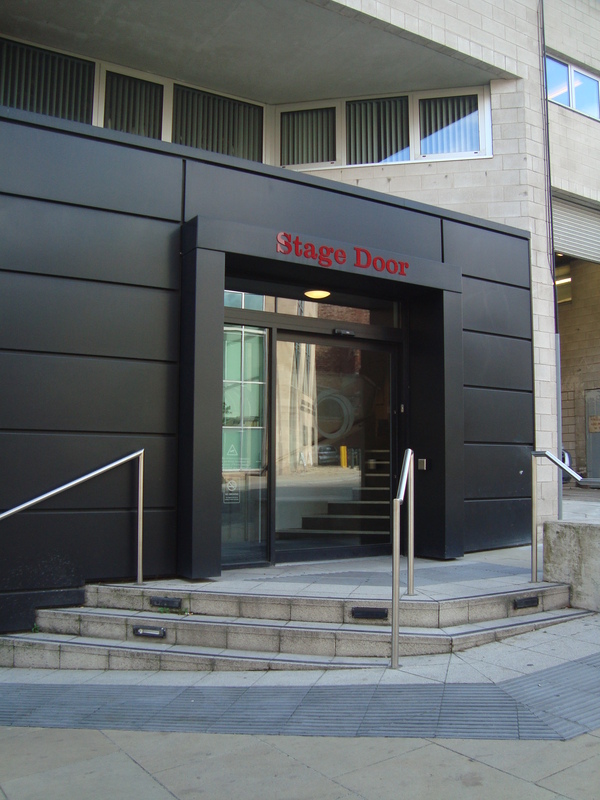 I got to the theatre at 12 noon and before I headed to the Stage Door, I queued up at the Box Office for a programme as I thought, ‘if I am waiting at the Stage Door I may get other actors’ autographs too!’ The queue was long and it seemed to take ages for my turn. I was getting a bit impatient thinking, ‘I’m going to miss him at this rate!’ I paid my £3.50 for the programme and headed around the side of the theatre to the dreaded Stage Door!! I had been in correspondence with the theatre for the past week. Ruth seemed particularly helpful and another person I should mention. She answered my query about how long the play was so I could plan my train journey accordingly. Then she sought out and gave me information on how to approach the Stage Door and enquiring about actors’ availability. Then if that wasn’t enough help, she updated me that production shots of Jonathan had been uploaded onto their website!! ‘Okay,’ I thought, ‘I was just doing what I was told,’ being a novice and all! So back out into the chilling wind I went. I could have left the letters for Jonathan at the desk but I thought it would be better me giving them to him personally, at least that way I’d know he got them. I waited just over half an hour, but with raging nerves and feeling oh so foolish, standing there being all fan like! It seemed much longer! My plan of getting other actors’ autographs didn’t play out. A few just walked past me without a second glance. Though to be fair I was not one to shout up and wave my pen and programme under their noses. I saw Daniel Lapaine arrive, then go back out and then come back again with lunch. Barbara Marten walked in quietly. One actor arrived via bike; I think it was Keir Charles. He just looked at me distrustfully and Gareth Williams smiled at me. I half worried whether I would recognise Jonathan, or would he sneak past while I wasn’t looking? I had my head buried in my phone texting when I looked up and there he was standing (alone) across the road from me waiting for traffic to pass. I thought, ‘here we go, put your brain into gear Christine.’ I didn’t know how best to attract his attention, so I just stood there waving at him (he probably thought I was insane!) and then I approached him as he crossed the road. I said, ‘I’m Christine, from the Facebook fan site,’ but I don’t think he heard me so I had to repeat myself. I don’t even know if he caught my name? ‘I have some letters for you,’ I said and I gave him the envelope with the little booklet I made. I hope he enjoyed reading all the lovely words of encouragement we offered him? ‘Thank you,’ he said and then I discovered he was still eating his lunch! Ops! I apologised profusely while he took a bite of what looked like a muffin or a flap jack. Sorry Jonathan! I was quite surprised at myself. I actually spoke to Jonathan without my heart beating fast, clammy palms syndrome or my mouth drying up leaving me with a stammer. I remained cool and collected and asked questions easily. I hope I came across that way to Jonathan? Maybe his account of our meeting would be different? Possibly I was an annoying fan who asked too many awkward questions while he wanted to hurry into the theatre to get ready for the performance? But for me it was ultimately a most pleasant experience. I had envisaged a ‘train wreck’ of a meeting, where I would be so star struck that all I could do would be to look down at the floor and not face him! Thankfully that was not the case and Jonathan did not carry the conversation, it was well balanced, and dare I say it seemed quite relaxed? ‘In an apartment?’ I asked. ‘Yes, we (the actors) get a list of digs,’ he replied. ‘That’s good.’ I said, knowing nothing whatsoever about the workings of a theatre company. ‘Yes,’ and then I told Jonathan that I had gone to Edinburgh last year to see him but that my fiancé was with me and it was all ‘rather embarrassing.’ Jonathan didn’t say anything to that, he just looked at me! Possibly the conversation could have died there and then! I knew I was keeping him from going about his work, but I just kept asking questions! So many questions to ask and so little time! I think I must have gone into ‘reporter’ mode. ‘What made you do Shakespeare again?’ I asked and that triggered Jonathan into talking about his career doing Shakespeare, Henry 6th and TV/radio work. I probably should have said I ‘loved’ him in Henry 4th, but I just stood smiling and listening to him. He seemed happy to be working at the Crucible, said the theatre had won accolades. He asked me if I had seen ‘The Winter’s Tale,’ before. ‘I’ve read it,’ I said. Jonathan then went on to say it’s a long play, but that he gets to have fun in the fourth act. He was proud of what the director Paul Miller said about the cast. ‘The company was the best he’d worked with in 20 years.’ That is some acclaim! I managed to get Jonathan’s autograph. I felt a little silly asking for it, but Jonathan was gracious. Luckily I already had the programme and he kindly signed the front. I didn’t read what he had written until after we had parted. He signed: ‘All the best. Thanks for coming.’ Which I thought was a nice touch. Thanks Jonathan! He said the theatre hadn’t given the cast any programmes and that he was interested in what was inside. So I leafed through a few of the pages for him and then he laughed at his cast picture, saying it had been taken for Victoria and Albert. I looked up at him smiling and said. ‘I think you should get a new picture.’ He smiled in agreement. I think that was the best moment for me, it seemed light hearted and fun and Jonathan was very close to me! Maybe a bit too close!! A little before that I had asked Jonathan if I could have my picture taken with him, which he kindly agreed too, though he seemed a bit worried that he hadn’t shaved! I hadn’t noticed actually! Of course at the time of asking, there was no one about! Then David Mallinson (in a nice hat), who plays Antigonus in the play (and meets an untimely demise at the jaws/claws of a bear! ), approached the Stage Door. I just looked at him and Jonathan asked him if he could take our picture, which he kindly did! That was when I glimpsed the director in Jonathan. Not content with a lamp post in the picture he repositioned us to the middle of the pavement. I just followed and stood beside him and smiled as David took the picture. Jonathan said it was a nice picture and it is, at least we are both sporting toothy smiles, but I seem so small standing next to him, even with four inch heels, Jonathan seems rather larger than life! I think I must have been talking to Jonathan for 10-15 minutes. I felt awful for taking up his time. I thanked him and we both spoke over our farewells as Jonathan rushed into the theatre and I to take stock of the encounter! The Crucible’s performance of The Winter’s Tale is over three hours long! However to me the time just flew!! Like every other Twitter comment and press review that came before, I must reiterate that the acting from all the cast was top notch and the delivery of the language was just perfect. The play rattled along at such a pace that I will probably be thinking about it for some time to come. When you see Shakespeare done well, you really feel it! The stage design was simple yet effective and I must confess that I did covet some of the lovely dresses the female characters wore, especially Perdita’s gorgeous white dress in the final act, oh I want, I want!! The Winter’s Tale, is a ‘strange play’, (borrowing Jonathan’s words there). With it’s fantastical ending, it’s like a fairy-tale, rather like my meeting with Jonathan seems to me now. It’s like two plays stitched together. To me it resembles a Gustav Mahler symphony. The tragedy of the first two acts is starkly contrasted by the light hearted humour in the fourth. Jonathan did look like he was having fun on stage as the ensemble danced and joked about during the sheep shearing festival. At one stage Jonathan, in breaches and red nosed disguise skipped past me, I didn’t know where to look! 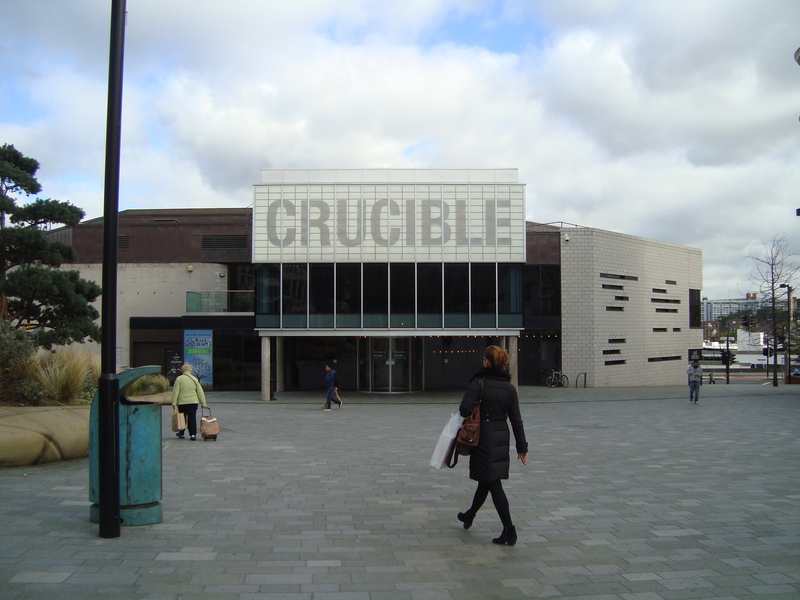 The Crucible itself looks a small performance area. From my seat I was trying to picture the snooker championship that goes on there and wondered how they accommodate two full sized tables! I was well placed in the ‘front row’ and due to liking end seats, I was right next to one of the entrances the actors used, in fact at one point Jonathan ran past me as he made his way onto the stage! As I visited the first matinee, the auditorium was half empty, or half full depending on your viewpoint. I presume the evening performances are better attended? I do hope so! The slow menacing entrance of the ‘bear’ raised a small titter from the audience. I was expecting a brown bear as Bohemia is suggested to be in Europe, hence a European Brown bear, but what the costume department went for was more of a Black bear, or to me it even looked like a Spectacled bear! Either way, it was a cute addition! It’s very hard to pick a standout performance as all the actors were fabulous! I particularly enjoyed Patrick Walshe McBride’s comic take on the young shepherd as a country bumpkin, especially his pronunciation of ‘see you these clothes?’ But you have to go and see the play to appreciate it. I shared a few uncomfortable glances with Keir Charles’ Autolycus as he stood right before me stuffing his purses down his pants. Again I didn’t know which way to turn! And Jonathan was just Jonathan, his command of the Shakespearean language I have always admired! I felt quite saddened when the play ended. I was having such a good time being entertained by the cast. As the actors came out on stage for their ‘curtain call’, I wiped out my camera to film it. I got the slightest impression that Jonathan wasn’t best chuffed to see a camera being waved about in my hand. Though in my defence I want to capture every moment, especially once in a lifetime moments like this! As the lights brightened and the audience began to mill out, I checked my phone and saw the time was 5.15pm! If I was quick I may have time to catch the 5.40pm train home! Otherwise it would mean hanging around another hour! Could I do it? Find my way back to the train station this time without getting lost? As I left the Crucible I noticed it had been raining, the floor was wet, but thankfully the rain had stopped. I was reluctant to leave Jonathan but as I left the theatre I said a solemn farewell, almost like a prayer. I thank him for being perfectly wonderful to me. Rushing in high heeled shoes is not conducive to looking good, so I waddled like a penguin back the way Margaret had shown me almost five hours previously. And did I reach the station in time? Yes! Did I get the right train? Yes! Though at first I thought I had not as I sat there for half an hour as the train carried me forwards in a bubble of silence. There was no PA system saying the next station would be Stockport until we were in Stockport! Then I relaxed. I had imagined I would come home all tearful after visiting Sheffield and meeting with Jonathan, but on the contrary I did not. I felt quite blessed to have had the experience. I had met with some kind and helpful people in Sheffield and Jonathan had been lovely! I was proud of myself for doing something so out of my comfort zone! It showed me that I can do anything I put my mind to!